On December 1, 2011, President Barack Obama announced his intent to nominate Ambassador William E. Todd as the next U.S. Ambassador to the Kingdom of Cambodia. The announcement also included nominations for several other key Administration posts. U.S. 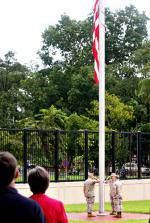 Ambassador to Cambodia, Carol A. Rodley, presided over a brief ceremony at the U.S. Embassy to commemorate the tenth anniversary of the September 11, 2001 attacks. “On September 11, 2001, the innocence of the world changed,” said Ambassador Rodley to honor the thousands of lives lost in New York, Washington, and Shanksville and all victims of terrorism. After the Ambassador’s remarks, the U.S. Marine Corps Security Detachment lowered the flag at half-staff and paused for a minute of silence at 8:46 a.m. – the time that American Airlines flight #11 struck the south tower of the World Trade Center. DUSHANBE — “Afghanistan’s Economic Development” trade fair held on Aug. 5 at the Borbad complex in Dushanbe featured wares from more than 120 Afghan firms. Afghan Finance Minister Omar Zakhilwal said that the wares of more than 120 companies were featured in the display, including agricultural produce, jewellery, rugs and other consumer goods from companies in Kabul and the provinces of Balkh, Kunduz, Kandahar, Herat, Jalalabad and Bamiyan. Transcript of Hillary Clinton's Town Hall meeting with students in Phnom Penh recently. SECRETARY CLINTON: Well, I am delighted to be here with all of you and I thank you very much for being here on a holiday and participating in this town hall. Kalyan, thank you so much for an excellent job. And Minister of Education, thank you so much for being here with us, and our ambassador as well. I have come to Cambodia for the first time, but it is a destination I have long wanted to visit. And I especially, was moved by the reports of my husband’s visit in 2006 when he returned home with stories of the progress that is being – happening here now that I wanted to see with my own eyes. With the visit of the Secretary General of the United Nations during the last week, the arrival of the Secretary of State of the United States at the weekend, the Prime Minister also involved with the ASEAN Summit in Hanoi, and the Cambodia Defense Minister in Thailand, it was probably one of the most intensive weeks of dealing with diplomatic relations and questions, and delicate problems. "Immediately after the Cambodian government appointed Mr. Thaksin Shinawatra as Samdech Dekchor Hun Sen's and the government's advisor, Bangkok was angry and summoned its ambassador back to Thailand as a so-called diplomatic retaliation. The Thai ambassador left Cambodia in the night of 5 November 2009. In response, the Minister of the Council of Ministers, Deputy Prime Minister Sok An, summoned the Cambodian ambassador to return to Phnom Penh. He consideres that this is a normal reciprocity measure between government and government. Regarding this diplomatic dispute, there has not been any new report about border tensions between the two countries. "Phnom Penh: The South Korean president promised to the head of the Royal Government of Cambodia to provide US$200 million in concession loans for 2009 to 2012 to develop the Cambodian economy and society. "The promise of such loan provisions was made during the two-day official visit of the South Korean President, Mr. Lee Myung-Bak, and his delegation in Cambodia on 22 and 23 October 2009. Together with the above concession loan, the governments of both countries also signed 9 agreements and memorandums of understanding to strengthen cooperation between Cambodia and Korea. "Nanning: The 6th China-ASEAN Expo - CAEXPO [第六届中国—东盟博览会 - 20–24.10.2009, in Nanning, in the Province of Guangxi - 广西省南宁市 - China] started officially on Tuesday, 20 October 2009, under the presidency of Chinese Deputy Prime Minister, Mr. Li Keqiang [李克强 - Pinyin: Lǐ Kèqíang], the Laotian Prime Minister representing the ASEAN countries, and the Secretary General of ASEAN [Dr. Surin Pitsuwan]. On the inauguration day of the trade exhibition, Cambodia signed two investment projects worth US$60 million. "The first investment project is for mineral exploration, with investments amounting to US$50 million, and the second project is for tourism, worth US$10 million. This is according to Undersecretary of State of the Ministry of Tourism, Mr. Pak Sokhom, who informed journalists during the exhibition in Nanning, China. "Phnom Penh: The Minister of Foreign Affairs and International Cooperation, Deputy Prime Minister Hor Namhong, said that the government of the People's Republic of China decided to provide more aid and loans for infrastructure development in Cambodia during the visit of Prime Minister Samdech Hun Sen to Sichuan to attend the inauguration of the 10th Western China International Economy and Trade Fair - 中国西部国际博览会. "The Deputy Prime Minister said so during a press conference in the morning of 17 October 2009 at the Phnom Penh International Airport after the Prime Minister of the Kingdom of Cambodia, Samdech Akkak Moha Senapadei Dekchor Hun Sen, had returned from China. "Just a week before a visit by the South Korean President to Cambodia, the ambassador noticed that the pace of investment, of commerce, and of other ties between Cambodia and Korea has flourished significantly, making South Korea the country with the most investors in Cambodia and with the highest number of international tourists' arrivals since the establishment of ties between both countries in 1997. "The President of the Republic of Korea will lead a government and business people's delegation to make an official visit to the Kingdom of Cambodia for two days from 22 to 23 October 2009.